Sorry it took so long but we had to wait until the official press release was made public for the sake of correctness. The reason why the show at Painswick Rococo Garden has been cancelled is that their partners pulled out over a conflict with a reality television programme leaving them no choice but to cancel. I am now waiting for my bags to be shipped back to me. I am posting its brief statement and project proposal just to tingle your imagination of what it could have been! Large and conspicuous. Glossy. White. Evergreen. Once considered special: a luxury, now just another commodity. Grown in the thousands for horticulture and commercial purposes yet rare in its natural range is considered a threatened species mainly due to its habitat destruction. Acid soil, rich humus and large amounts of water are what it needs to live. Like human beings it doesn’t tolerate drought. From East Asia all the way to Verdi’s Traviata and Dumas’ lady, from colonization to globalization, this ornamental plant is witness to a great deal of our modern and consumerist history. 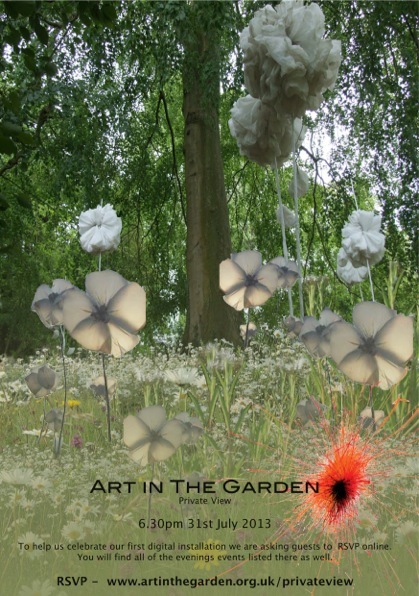 Its extended family now includes a new species only to be seen at Art in the Garden. I am talking about giant white Camellias made out of recycled plastic bags. They’re up to 10 feet tall. Bare white stems hold onto large reclining corollas. Like umbrellas their diameters reach 5 feet of width. Sparse white leaves sprout up their one-only stalk. The flower’s structure is beautifully simple. Rebar poles wrapped up in white plastic make the stems, while plastic bags and metal wire are moulded into the corolla’s petals and leaves. A little colony of nine camellia-like-flowers will grow in the forest just off the path’s edge. Seven of them will be set on one side of the woods’ trail and the remaining two will stand aside on the other (please see photo for exact location). Although they will be swaying in the air powered by the wind, their roots will be anchored into the ground (possibly in some cement poured inside a black bin bag to make sure they do not to contaminate the soil). I will need two days approximately to install the camellias. The rebar poles are to be ordered and delivered to the site. The corollas and leaves I will have made separately and will carry them with me. In loco I will then assemble the different parts. All together the intention of the artwork is to complement the existing landscape with fairy-like elements that can suggest a story. The camellias will blend in as well as stand out from their temporary borrowed surroundings creating a fable-like scenery where nature and culture can briefly coexist in a world of art and poetry. This short-lived marriage is to raise a series of questions on the relationship between nature and us. While nature is the continuous source of our culture, can we transform our culture into nature? Further to this, how ethical is my artwork? Is it another selfish act of exploitation in the name of art? Am I just contributing to diminish the value of both nature and art? And in the end will beauty really save the world like Dostoyevsky proclaimed? And if so what kind of beauty is it going to be? As much as I try to be mindfully conscious and discrete I will inevitably disturb the balance of an ecosystem affecting it with my artwork if not just by digging a hole into the ground. Ultimately roots can only be replaced with cement and leaves and petals with plastic bags because I cannot substitute nature but only try to complement it in the most respectful way possible. Nature and plastic bags both overlooked and taken for granted come together in this occasion to stand out again, distinguish themselves and claim back their special uniqueness while also creating a tension of contradictory values and clashing realities. Camellias: mirrors of our volatile moods and landscapes witnesses of human anxieties. Ever-changing landscapes destroyed and revived into new forms. Landscapes created by the insatiable need for innovation. Laced Plastic bags, the body of evidence of ‘FUNERAL TO A PLASTIC BAG‘. In that video a hunter shoots at my bags. ….the story of my life …and of my bags too! But this time the bags were completely on their own, stranded and lost. From Nice airport to Munich then Birmingham and back to Nice and eventually Italy! The actual final destination was London were I was desperately waiting for them to join me. The bags will be part of my next show at Rich Mix on Benthal Green Road (I will post more about that later on). After 5 exhausting days of a frenzy chase of the bags, tracing them from one airport to the other via mobile phone (which I eventually also lost on the bus)I decided to remake parts of the artwork in order to avoid an embarrassingly meeting by presenting myself empty handed. Once I realized that the bags where never going to return to me in time, I rushed to buy (very bad!) 100 new bags and a dinghy. Three hours before my meeting I was sitting on East London’s pavement taping bags in the scorching heat wave! Here are pics of the airport stickers that witness the adventure. 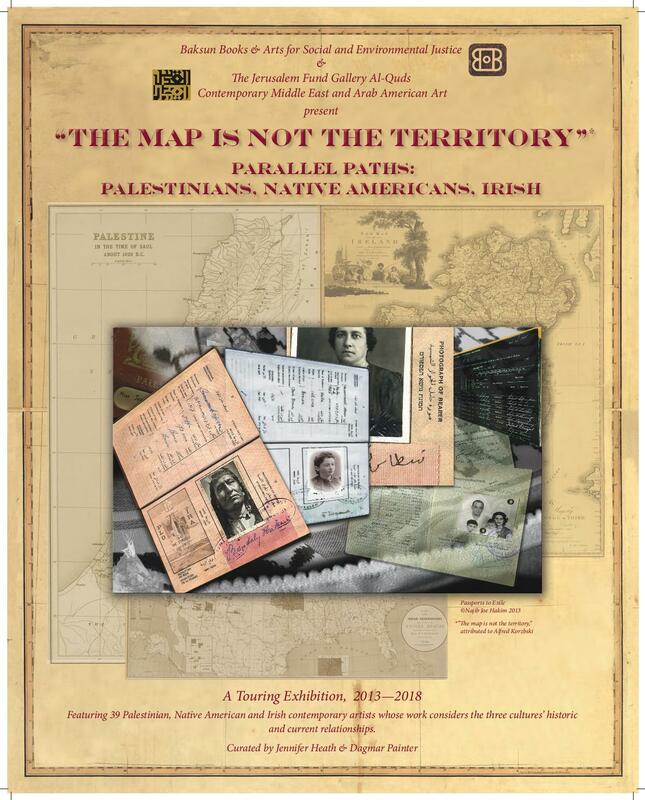 COMING SOON IN SEPTEMBER: THE MAP IS NOT THE TERRITORY. This juried invitational exhibition, conceived by Jennifer Heath of Baksun Books & Arts, and co-curated by Dagmar Painter opens September 6, 2013 through October 18. 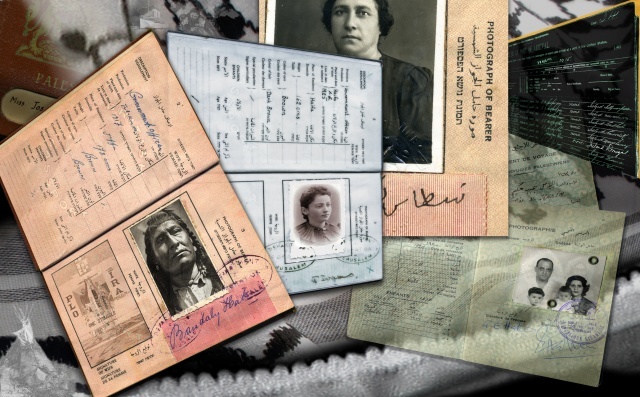 The exhibition features 39 artists from around the world who have created artworks that examine the shared historical and contemporary paths of three cultures: Palestinian, Native American and Irish. The exhibition will examine themes such as occupation, conflict, resistance, land, food, home, identity, diaspora and more. Ve la ricordate la fiaba di Raperonzolo? C’era un volta una principessa che aveva i capelli così lunghi che ci si poteva arrampicare su per raggiungere la sommità della torre in cui abitava… Ecco, invece dei capelli, immaginate una liana con petali fatta di sacchetti di plastica che risale la tromba delle scale di un palazzo moderno. Il palazzo in questione è ilMuseo di design e arti applicate contemporanee (MUDAC) che ha sede a Losanna, in Svizzera. Qui, fino a ottobre, sarà allestita “Coup de sac!“, una mostra dedicata al sacchetto di plastica. La liana “Raperonzolo” (foto 1) è un’opera realizzata da Claudia Borgna, eclettica artista di origini nostrane che ama dare vita a paesaggi fiabeschi attraverso installazioni tanto monumentali quanto effimere che nascono dal suo interesse per il paesaggio e il nostro pianeta invaso dai rifiuti. Simbolo per eccellenza della società consumistica, all’interno del MUDAC il sacchetto di plastica viene rappresentato come un supereroe dai poteri stra-ordinari: la resistenza e (quasi) indistruttibilità e la capacità di inquinare al punto da generare la morte. Fotografato, accartocciato, ricoperto d’oro, gonfiato, ricamato, è considerato nella sua duplice natura di oggetto d’uso comune “da non disperdere nell’ambiente” e opera d’arte.Trenta artisti e designer di fama internazionale lo hanno raccontato attraverso l’arte contemporanea, esprimendone tutti gli interrogativi e le sfide attuali sollevati dal suo utilizzo massivo. L’ecologia e il riciclo, l’effimero e la trasformazione, il design e l’artigianato, la società di consumo e la politica sono alcuni dei temi affrontati dagli artisti. La mostra gioca sui contrasti e le contraddizioni. E’ il caso ad esempio della collezione deisacchetti distribuiti nelle strade svizzere e tedesche per raccogliere i bisogni del proprio cane. Un paradosso tutto contemporaneo quello di invitare ad imballare un prodotto organico e biodegradabile con del materiale inquinante difficilmente riciclabile. E cosa pensare di un sacchetto griffato Louis Vuitton abbandonato in un angolo come fosse pieno di spazzatura (foto 2); oppure di sacchetti in seta finemente ricamati esposti in una teca, come fossero oggetti preziosissimi (foto 3)? L’intento della mostra è quello di osservare il sacchetto di plastica con un nuovo sguardo. «Trasformandolo in oggetto di valore gli abbiamo dato una nuova importanza. Ci penseremo due volte prima di gettare il prossimo sacchetto di plastica» hanno dichiarato gli organizzatori. Ed è per questo motivo hanno scelto di esporre un sacchetto ricoperto d’oro 24 carati (foto 4): un oggetto delicato che rivela una grande complessità, allegoria della nostra società consumistica per cui l’oro e il petrolio sono diventati due materiali indispensabili. Insomma, dopo la contemplazione estetica si finisce necessariamente per riflettere sul significato che il sacchetto di plastica ha assunto nelle nostre vite. Oggetto di culto o rifiuto, adorato o criticato, il sacco di plastica divide gli animi, li polarizza e rivela il nostro comportamento di consumatori. Rafforza il nostro statuto e la nostra identità, indebolisce l’ambiente, è collezionato per amore o per coscienza ambientale, costituisce un tema di attualità in politica come nell’arte. Ed è così che va letta l’opera forse più virulenta di tutta l’esposizione: la croce gigante composta dai sacchetti di Lidl e Aldi, le due catene di supermercati low cost dominanti in Germania, simbolo di una società che ha fatto del consumo una religione (foto 5). La croce fluttua nell’aria, costantemente gonfiata da un piccolo asciugacapelli. Cosa succederebbe se qualcuno staccasse la spina? I am not sure why, but I have just received the bad news that the exhibition has been cancelled, a real bummer! I have already made and shipped the work on top of booking a series of complicated travels and the accommodation for it which I’ve all payed in advance for.